I was lucky to win a pair of tickets from Style magazine to Guess' launch party of their Fall Collection 2014 of bags and shoes last Saturday and I brought my mum along to it. 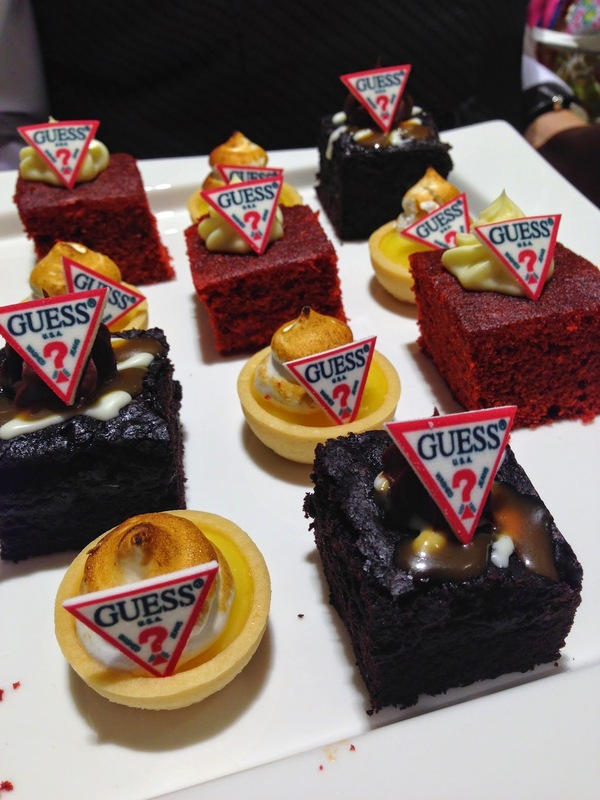 There were a few canapes but the most adorable were these pastries with Guess logos made of icing sugar! The caterer for the event was One Paradise, the catering arm of Paradise Group. Thanks to my occupational hazard, my guess is that the catered food cost an approximate $25/pax (they were giving out bottles of Fiji water) and excludes the wait staff (approx $80/server). Was it worth it? Mmm...I'll stick to Creative Eateries/ Marmalade Pantry. I really liked this pair of shoes but they looked really uncomfortable and it didn't help that the model was teetering on them while walking up and down the short runway. Oops. That's mum and I enjoying the show just after we had our make up touched up by Make Up Forever. With my gift card, I ended up buying this pair of denim wedges with lace heels. It's super super pretty and I love it loads!! It's part of their latest collection which was inspired by the Wild West, hence the denim. I wanted to wear it to work but I fell down on Monday (which is another story) so alas...it'll have to wait. We even had a goodie bag on our way out! The goodie bag itself is a usable Guess mesh and PVC tote and it contained a Style magazine, a complimentary month subscription to the digital edition of Style and samples of Make Up For Ever's Eye makeup cleanser and Microfinish Powder (excellent for absorbing oil). I must say that it was a fruitful afternoon and I love my haul. Thank you Guess, Style and Make Up For Ever!